When the biggest platform in PC gaming teams up with an established Taiwanese manufacturer to produce a virtual reality headset with fully motion tracked controllers, you stand up and take note. The HTC Vive for Steam VR redefines gaming, and more besides. It’s the closest thing to a Holodeck I’ve ever seen. And it’s absolutely incredible. Before you ask: I haven’t forgotten about Oculus. I was an original Kickstarter backer (my DK1 Oculus Rift Development Kit Review and Giveaway Oculus Rift Development Kit Review and Giveaway The Oculus Rift has finally arrived, and is making heads turn (literally) all over the gaming community. No longer are we confined to to peering through a flat window into the gaming worlds we love... Read More , and DK2 review Oculus Rift Development Kit 2 Review and Giveaway Oculus Rift Development Kit 2 Review and Giveaway It’s been a year since the first Oculus Rift Development Kit was released, and it’s safe to say the world of gaming will never be the same again Read More ), but sadly some component shortages meant launch delays and I still haven’t received my unit at the time of writing this, so the Vive arrived first. That’s not to say the Vive launch wasn’t atrocious either: only Paypal orders in Europe were delivered first, after Digital River blunders (the payment processor here) led to most debit and credit card order being cancelled because of fraud protection measures. If you’re affected by this despite having pre-ordered within minutes, you have my sympathies. I strongly suggest watching the review video. It’s hard enough to describe the experience in words, a video of it in use is a lot better, but this is still something that really needs to be experienced yourself. Let’s get this out of the way first, because it’s a very big number for what is essentially a gaming peripheral: the HTC Vive costs $800 (or £700 in the UK, with taxes), plus shipping. It also needs a high-end PC, as the demands for VR are even higher than that of typical gaming on a monitor. Valve provides a performance testing tool for you to check if your PC is VR-capable. An awful lot, actually. Let’s break it down. The headset itself, with hardwired 5m+ cable. Link box, into which the headset plugs in. A sticky pad is also supplied, so you can affix the link box to your PC case. DC adaptor, USB3, and and HDMI cable, which go from the link box to your PC and a power socket. Pair of controllers, as well as a pair of micro USB cables and suitable charging adaptors (though of course you can use any existing micro USB charging cables and adaptors you already have). Pair of Lighthouse Basestations, and a power adaptor for each. Wall mounting points for the Lighthouse Basestations. You can also use a lighting stand or tripod with standard 1/4 inch thread, but will need a ball head to point them down slightly. A shelf would also work. 50ft sync cable for Lighthouse Basestations (only needed in rare cases where something is obstructing the wireless communication). Earbud headphones. A standard stereo socket is broken out on the headset, enabling you to use your own headphones (or none at all, which is not recommended for the sake of immersion, but may be better for social gaming). Setup was easy, the only mildly annoying part being that you need to create an HTC account before you can proceed to install the setup application. Some reviewers has lamented the laborious process of positioning and plugging in everything, but it doesn’t take more than 20 minutes if you understand the difference between HDMI and USB. The headset goes to the link box, the link box goes to the PC and a power socket. Place the Basestations in either corner of the play area, at about 2m above the floor, tilt them downwards, and plug them each into a power socket. Boom. That’s it. You only need the sync cable if your Basestations are too far apart or have no line of sight to each other. Although I’ve got some lighting stands on order to position the Basestations higher, for now I’ve rested one precariously on top of my router, and another using a Snake Clamp Hold Anything, Anywhere: Snake Clamp Review and Giveaway Hold Anything, Anywhere: Snake Clamp Review and Giveaway SnakeClamp is an American company with one simple mission: to help people and companies hold what they need, right where they need it. Read More attached to an Ikea shelf. Also in the package are some proper wall mounts, but I’m loathe to drill into the wall of my living room since it was built in 1850. I do however appreciate the irony that a room which is this old has been fully repurposed into a dedicated VR playspace. First time setup or after moving the Basestations will also involve defining your play area. This is a 5 minute procedure where you walk around tracing the edges of your useable space. Steam VR then takes your traced area and further refines it into the largest possible rectangular area. As for the headset itself, it can be a little awkward to adjust the straps for the first time. Glasses wearers such as myself will either be annoyed they don’t fit at all, or completely surprised they fit without any issue. I fall into the latter camp. I don’t have huge frames, but they tucked neatly inside and didn’t push against my face, partly thanks to the indentations in the foam padding at either side of the headset, into which frames can rest. Others have reported their frames pinching their face, so you may have a different experience. An IPD adjustment dial is provided underneath the headset; rolling it in either direction will bring up an on-screen indicator of the current setting in millimeters, but there’s no utility for figuring out what your IPD actually is. You can either twiddle it until it looks right, or get them measured at an optometrist. I’ve been using it at the standard 68mm, since I haven’t the slightest clue what my IPD actually is. My initial thoughts were that it’s remarkably comfy once on, though it did steam up a little – probably my perspiration from excitement. The field of view seems marginally better than the Oculus Rift DK2, and after trying the Magic Shop vignette in The Lab, I’m stunned by the clarity of small text on posters on the wall. The so called “screen door effect” is present, but unnoticeable outside of loading menus. The only issue that is prevalent, and seems to be true of any fresnel lenses including the Oculus Rift, is a kind of lens flare, or streaks of lights emanating outwards when one looks at bright objects on a dark background. The community has decided to dub these “god rays”. While distinctly noticeable in certain situations, they don’t detract from the experience once you’re immersed – most of the time you’ll subconsciously dismiss them as intended effects. In menus systems, it made me aware that I was staring at a screen close to my eyes. Reddit user DuranteA explains well the differences in the lens flares between the Oculus Rift and Vive – be sure to read that for a detailed and visual guide to the artifact. The most striking first impression is simply that of presence: I felt completely immersed in a place I was not. I was teleported there – not just looking through a window. The Vive controllers are quite a curious design with a large open ring of sensors at the top, but the most important facet of them is that they are tracked to an unbelievable level of precision, to the point that one could actually catch them if thrown with the headset on. In more practical terms, once you’ve placed on the headset and completely blocked out the real world, you’ll have no issue looking down and picking up the controllers from the floor. They have a single, clickable trackpad under your thumb, which mutates into a number of quirky control schemes depending on the game. In Hover Junkers, you click the trackpad to pull out the chamber of the pistol, spin your thumb around to reload, then flick the entire controller to put the chamber back in. It’s a neat use that shows what developers can do with such a versatile, multifunctional control system. In other games, it serves only as a teleport button. In the Gallery allows you to both teleport, and change the orientation before the jump, though it’s less intuitive than I’d hoped. The trackpad is far from perfect though; I’ve listed the issues separately later. As well as the trigger, a further two buttons (or is this just one button that’s linked together?) is located on the sides, a Menu button above the trackpad and a Steam button below. The Steam button brings up the Steam VR home dashboard at any point. The Menu button above is dependant on the game; some use it to pause, others open a settings menu, Hover Junkers uses it to select weapon. Then there’s the haptic feedback – more nuanced than a simple rumble pack. How the developers choose to use these will be up to them, but from what I’ve seen so far, the haptic element adds a lot to the immersion of any experience. In the Steam VR tutorial, I actually jumped back and let out a little squeal as I pulled the trigger and felt a giant laser beam emitted from the end. The best use I’ve seen of it so far has been in The Lab’s Longbow demo, where you feel the bow string being pulled taut as you notch an arrow and pull it back. The way in which the controllers mutate into something unique in every game – whether they’re a pistol and shotgun in Hover Junkers, a bow and arrow, or just a pair of hands to point with – feels magical every time. Overall, I’m really impressed with the controllers and their level of tracking precision – they are a key part of what makes the Vive such an amazing experience – but the button placements seem hastily designed and prone to accidental touching. I’m also not convinced by the utility of the trackpads. Accurate positional tracking is enabled by placing the two Lighthouse Basestations in each corner of the play space. These are actually quite “dumb” devices, and don’t act like cameras. Instead, they emit bursts of lasers all over the play area, which the headsets and controllers then pick up on (the small indents are where the optical sensors are located). This is in contrast to the Oculus solution, which is the inverse: a camera is constantly watching where the headset and controllers are, which themselves emit signals through a matrix of IR LEDs. I can’t judge which is better yet, as the Oculus Touch controllers aren’t released yet, and won’t be for a few months. When the time comes, I’ll do a direct comparison of tracking solutions. A bundle of four thick cables hangs down from the headset, and tethers you to the link box with 5 meters of freedom (which is the maximum diagonal distance between Basestations, anyway). Other than that, the Basestations require a power cable. The 50ft sync cable isn’t needed in most cases – as long as there’s line of sight between them, all is fine. You’ll also have two micro-USB cables somewhere to charge the controllers and update firmware if required. The main cable bundle was most noticeable in Hover Junkers – a frantic western shooter played out on hovering ships assembled from scrap – but outside of that I rarely noticed it at all. You either develop a sixth-sense for where it is, stepping over it as it brushes your legs, or it simply doesn’t get it the way. On very rare occasions, I had been spinning around so much that the cable twisted, forcing me to take off the headset and untangle everything, before rejoining the virtual world. The addition of cabled headphones however complicates matters further, making putting on and taking off the headset complex for the unpracticed. HTC provides some earbud headphones which have a thankfully short cable, but I can’t abide in-ear headphones. You might get away with Bluetooth headphones, but I wouldn’t risk it when the odd drop-out could really hurt the immersion. The sound output enumerates as a USB audio device along with a microphone. By default, the camera is actually disabled, and HTC advises that if you experience tracking problems you should reduce the refresh rate or disable the camera entirely. Some USB ports are apparently incompatible, perhaps because the sheer number of USB devices that present themselves through the headset are just overwhelming. I had no such problems on my Gigabyte Z97-D3H motherboard, and the camera was happy at full refresh. So what can the camera do? At the moment, there’s a couple of modes you can enable once the camera is on. The first is a realistic view of the world that sits in a small screen next to your controller when in the Steam menu. It’s of limited use. The second (and third) have been dubbed Tron-mode, and can be turned on when the user either approaches the Chaperone bounds, or when double-tapping the home button, or both. I opted to disable the Chaperone camera feature as I found myself often approaching the bounds in any game, and it tended to ruin immersion. However, having the camera a double-tap away is immensely helpful to keep one foot in the real world. It’s only a single camera on the device, and as such the mapping is not one-to-one in the virtual world; more like a spherical view that’s been re-mapped. You would need two cameras, placed exactly where your eyes are, in order to map more closely from the real world to the virtual one, but I’m sure this is something they’ll be looking at for version 2. There were rumors before launch that the addition of a camera might allow the user to map more complex play spaces – like a Kinect can scan the environment – but given the lack of depth perception from a single camera view, this won’t be technical possible. The Lab is the only first party “game” available, though it’s actually more a selection of 8 mini-games and experiences inside an overarching Portal theme. Each were developed by Valve as they experimented with various concepts in VR; some are therefore not as good as others. My own favorite is Longbow, a castle defence game where you shoot little ninja viking things trying to attack. It’s simplistic for sure, but incredibly fun, and demonstrates how much haptic feedback – a subtle vibration as you notch the arrow –can add to the immersion. Postcards is a number of photogrammetry scanned locations where you can walk around the serene scenery and play fetch with your robotic dog. Also included is the infamous robotic repair demo. The Lab is to Vive as Wii Sports was to the Nintendo Wii; a perfect introductory title to show friends, and maybe even something you’ll keep coming back to. Vanishing Realms is a dungeon crawler hack and slash where you actually wield your sword and shield as you battle your way through the levels. It’s a short game, but every fight is as thrilling as the last. British folks who were kids in the 80s will understand what I mean when I say it feels like you’re taking part in Knightmare. AudioShield – the VR successor AudioSurf – is another of my favorites, but only once I’d got my own music in there. The default selection is mostly anime remixes from SoundCloud, which just isn’t compelling. You stand in the center of a large arena, and hold your shields up to defined against the incoming orbs of light, which explode once they hit your shields. Once I’d filled it up with my epic collection of Japanese para-para and trance tunes, I could dance the night away. You do however look rather stupid, as can be seen in my review video. I wouldn’t call it heavy exercise, but a couple of rounds to something high energy will necessitate a break. All of this is encompassed within the new Steam VR interface from the moment you put the headset on, to the moment you take it off, and can be returned to at any time with the Steam menu button on the controller. You can change the background here too – any 360 spherical image will work, and you can download popular backgrounds from the workshop (I’ve since set mine to the Star Trek Holodeck, the default desert and night sky are rather boring). Curiously, there’s also a separate Vive specific interface, which promises to add widgets to your custom environment, and eventually hook into your phone via an app. However, given that it’s essentially just another game launcher on top of the existing Steam VR launcher, it seems unlikely anyone will use it as their primary interface. What is clear is that there’s enough content at launch to demonstrate everything from serene exercises in creativity with Tilt Brush, to full on frantic shooters like Hover Junkers. There is something to appeal to everyone, and I strongly suggest you check it all out; not only to support all the hardworking developers who are making these great experiences for such a niche audience, but because you may find you enjoy a whole new genre which you would normally have dismissed. Demands on room scale are entirely up to the developer, but the ideal situation is an experience which scales well for both small and large play areas, with no minimum size. The first-party Valve “The Lab” demonstrates this, allowing you to both freely explore within the confines of whatever play space you have, as well as enabling quick teleport around larger spaces. Others such as Job Simulator have a minimum required play area (2 x 1.5m); either you meet the minimum, or you’ll have difficulty playing. This is less optimal, but the easiest to program since it assumes the exact same size or play area from every user. Hover Junkers offers a selection of ship sizes that should cater for everything from standing directly in front of a desk to the largest allowable area. Other games may completely ignore room scale, and ask you to either sit or stand in a single area; these will likely be anything developed for both the Oculus Rift (without Touch controllers) and Vive. AudioShield is a good example where you’re essentially standing in one place the whole time, though you may find your flamboyant flailing arm movements push your play area boundaries anyway. One thing I’ve noticed though: no matter how big your play area is, you’ll always want a bigger one. Let’s talk about the downsides. Though the controllers as a package are incredible, I cannot get used to the trackpads. When trying to make a Paypal purchase and presented with on-screen keyboards, where you use the trackpads to glide over all the letters, I found them to be completely useless. Heat build-up inside of the headset can be a problem from the get go if you’re already in a humid and hot environment, but either way you’re probably going to work up a sweat in certain games. This gets a little uncomfortable after a few rounds of something like AudioShield or Hover Junkers, and your own tolerance will dictate whether you need a break at that point or will just suffer through. In less intense games, this is a non-issue. Updating the firmware on the controllers can also be awkward; you’ll notice a generic error on the SteamVR window, then you’re instructed to turn the controllers off, and plug them into USB. These needed to be directly to ports on the back of the machine for me – front USB ports failed. Then you need to do each one by one; it doesn’t upgrade both controllers at once. It took me about 15 minutes of messing around to get them updated. Finally, Steam VR is still quite buggy. A couple of times, after redefining my room size, the headset defaulted to placing me at eye level with the floor. Fixing involving running through the setup program again, sometimes twice, before it would work correctly. I’ve also experienced a number of random game crashes, but thankfully those usually occur within the first minute of opening them, not during gameplay. This may be due to some interference of the older Oculus utility, but I haven’t been able to pinpoint it specifically yet. You can download the SteamVR Performance Testing tool from Steam to get an idea of what to expect. Even having recently upgraded the CPU to an i7 4950k, my PC teetered on the edge of the green “Ready” spec; this was no doubt due to my graphic cards, a pair of aging R9-290s bought for the purposes of mining Dogecoin a few years ago. Running in crossfire mode meant I could use them comfortably for regular gaming, but crossfire/SLI actually gives a performance hit to VR applications, so that needed to be disabled, leaving me with a single card at the lower end of the acceptable spectrum. Anything less than that and you can give up all hope of having a smooth experience. Basically, you will need to upgrade, unless you already own something ultra-high end that was built for 4K gaming. It’s easy to dismiss VR in general and specifically room scale tracking as a gimmick – until you’ve actually used it. No amount of reviews is going to convince you otherwise, I promise. 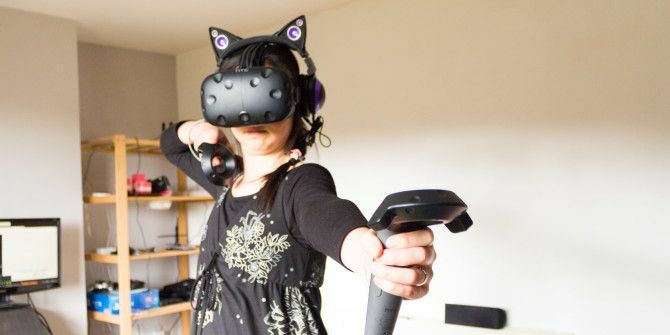 The HTC Vive is unlike anything you’ve ever tried before. It’s addictive, and has the potential to change the world. It is, literally, a new dimension, of infinite worlds and possibilities. I am simultaneously both marvelled and terrified by the power this device can have over me. This is it: virtual reality is finally here. This is where dreams are made. The high cost of entry is sure to keep the Vive only in the hands of early adopters for the foreseeable future, and it’s possible that in the long term there simply won’t be enough of market to sustain game developers making the content for the device. That’s a valid opinion to hold, and it’s a good reason to not risk $800 on a device that may have no content next year. But I’d argue that there’s already a lot of very compelling content, and for those who can afford, there’s a lot worse ways of spending $800. Whatever your feelings, I’d urge you to try the Vive at a retail location (selected Microsoft stores in the US, PCWorld in the UK) or local meetup group, and experience this magical device for yourself. Explore more about: HTC Vive, MakeUseOf Giveaway, Virtual Reality, Virtual World. Im sad, but to be fair, it was near impossible to win with a 19 in 93901 chance. Congrats David! Hey! That's Yuumei's headset isn't it? The axent headphones. Well done David! I must admit I'm pretty envious! Congrats David! Enjoy your HTC Vive! I hate you David so much right now but congratulations! Please come back and tell us your empressions when you recieve it! Where is the winner announced ? Calm down, it's only just gone 9am here! Great review, can't wait to try myself into the VR world! I really really want a HTC Vive.... It's just so much fun... Shall have the PC horse power...but no more budget for the Vive. Specially with this super expensive AUD price tag... May the luck be with us all haha. 26 hours 56 min 22 seconds..
Looks amazing! Been looking forward to trying one of these for awhile now. Thanks for the great and sincere review, the Vive looks to be a clear winner in 1st gen VR. The room scale experience seems so important in creating, well, a new experience! If we're going to bother with VR, it should be headfirst into new territory! I don't recall being as excited about a tech product as this one. The escapist in me demands this now, the price really is prohibitive. No worries, just got to rob a small bank. I will try it if and only if i Have GTX 970 or GTX 980 or GTX 980ti GPU. Wow, this looks awesome. Thanks for the review and information. Ha! Ha! The cat ear headphones was a nice touch. Looked like a cat pawing at butterflies. Vive looks incredibly fun, and I hope some entertainment places rent out VIVE VR rooms for like 30 mins for $10, or something. Having to install those cubes is a drag. The price point and requirements is crazy, but no problem for some of the PCMR elite. I hope the trend keep growing so that the tech will advance and get cheaper. It's funny how Oculus was all the rage and now it seems like no one is even talking about it anymore. In all honesty, the Vive really leap frogged it with all the feature richness. Oh and terrific review by the way! Agreed, its not hard though considering oculus have treated their loyal fans so so horribly. And palmer Luckey just seems like an absolute wayne ker. I have been following the Vive for ages. I tried it out at PC world last month and i thought it was absolutely amazing. I tried Pirate trainer, tilt brush and Job simulator i NEED this in my life!! I couldn't go all out because there were two many people in the store and i felt self conscious dodging around like a maniac, but Pirate trainer definitely made me lose any dignity i had while wearing this HMD! Would be awesome to win one! Also, more mention of the Camera should be mentioned in reviews, It seems to be very useful and helps define it, yet isn't really mentioned much in other reviews. Yeah, I guess because it's disabled by default, and the setup doesn't mention it either as an optional step, so you have to go meddling with SteamVR settings to find anything about it. It's an odd decision to hide it like that, but I suppose the incompatibilities caused more problems that worth during their internal QA. Superb, one of the best VIVE reviews I've seen so far. Unless Oculus can pull something out of a hat really soon (ie. touch controllers that blow the VIVE's peripherals out of the water) then I will be opting for the VIVE after all. Nice review. Not sure if I'm ready spend $800 to go the next step from a Gear VR setup. Ohhhhh so much WANT! And I am loving the kitty cat headphones as well! I don't understand where to enter the ******* code to enter the competition. Where do I enter it? Yeah, I eventually figured it out. Cheers. Tried this out at a friends house it is AWESOME!!!!!. Not used to gaming which showed with my kill rate and low score, but I think I could become addicted to this. BEST OF LUCK , EVERYBODY! THAT, OF COURSE, INCLUDES ME TOO! A thousand times better than the Oculus Rift. Wow nice. !! How is the resolution? With the Samsung VR headset and S7 you see lots of pixels. GearVR is actually higher resolution, though it's an extremely poor experience in general. There is no comparison. You will continue to see pixels for a few generations of VR headsets, until 4k screens become small and affordable enough to cram TWO of them into a headset. I am watching different VR videos from past 10 days. I would like a fair Vive vs Oculus review. It would be nice if you review them fairly. Holy Batman, luv & kudos to ur divine review. . Wow, prize HTC is fab. & splendid. 2 fingers snap. It is tight, fly & off the chain. Thank you for the awesomeness, the contest, and generosity. :) Pick me, pick me! I need this, I will be (hopefully) buying one by the end of the year! Because of the high end computer, this is very expensive. Great review and thank you. It is so rare that you gave a product 10/10. If you do this I believe it worths every penny. This is the near future and soon it will be wireless. Thank you again for great and detailed review. Not a bad review. My biggest complaint with any of thee technologies is the cables. Cables everywhere. Glad these are long enough but i have seen users playing while others walk by not notice the cable and pop the headset pulls you or the device or PC connection somewhere you dont want it to be. But glad to see a real review of the device than a mock up "trying to sell it to someone" kind of review. Trying to follow on instagram but its coming up with this account can not be follwed right now, its been a week and still the same.